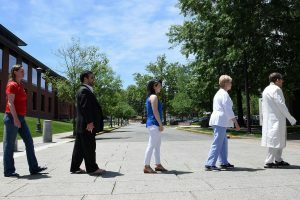 Wesleyan-affiliated members of the all-star benefit band re-create the iconic Abbey Road album cover on Wyllys Avenue, in homage to the Fab Four. From left to right: Shona Kerr, Andy Chatfield, Sarah McNamara, Nancy Brown and Peter Standaart. This year’s all-star band includes Chatfield on drums; Shona Kerr, adjunct professor of physical education, and head coach of squash (men’s and women’s), on backup vocals; Nancy Brown, private lessons teacher, on trumpet; Peter Standaart, private lessons teacher, on flute; and Sarah McNamara, assistant director, employee relations, Gordon Career Center, on violin. 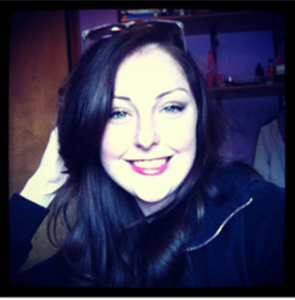 The benefit concert is held in memory of former CFA intern Stephanie Nelson. Read more about the 2015 benefit concert, featuring The White Album, and the 2016 benefit concert, featuring Sgt. Pepper’s Lonely Hearts Club Band. Click here to view video from both concerts. 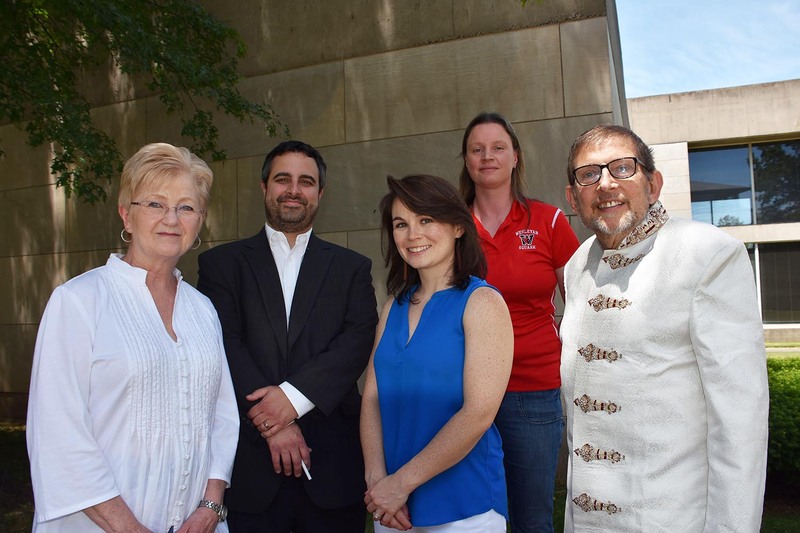 The event will take place outdoors on the Pavilion Deck at MCC. Ticket prices (in advance and at the door): $25 for the general public, $10 for students, and free for kids ages 12 and under. Middlesex Community College alumni can purchase discounted $15 tickets to the event. In case of rain, the event will take place on Saturday, September 16, 2017, at 6 p.m., inside Chapman Hall at Middlesex Community College. To buy tickets, donate to the scholarship fund, or for more information about the event, click here.